Operator and technical training for pedestrian and ride-on lawn mowers, tractors, utility vehicles, ATV's, brush cutters/trimmers and hedge trimmers. Cutting Edge Training™ is committed to providing a world class operator training and technical training service for land-based industries. Cutting Edge Training is able to offer, via approved suppliers, operator training supported by both the Lantra Awards ad City and Guilds NPTC. Our Operator Training programmes are available to ALL technicians and operators, irrespective of manufacturer or machine type. Most typically operator training is held at the customer's premises using machines that delegates use during their normal working day however; it is possible to arrange bespoke courses for specific purposes. 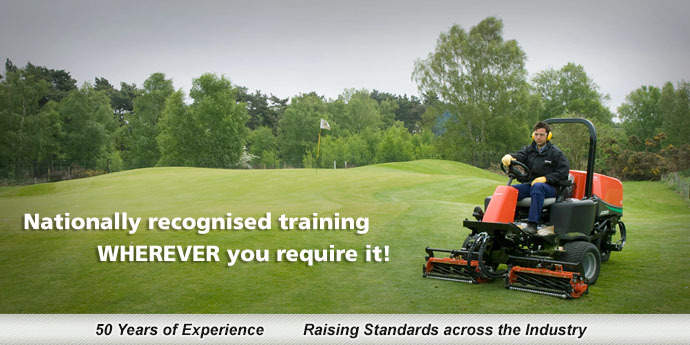 Cutting Edge Training is the training division of Ransomes Jacobsen Ltd, but able to offer Technical and Operator Training on all products within the grounds care industry. Cutting Edge Training has already successfully trained operators of Ransomes Jacobsen, Iseki, Hayter, Kubota, John Deere, Toro, New Holland, Kawasaki, Honda, Yamaha, Stihl, Husqvarna and Echo products. ©2017 Cutting Edge Training™. All rights reserved.